Design West Landscaping offers a wide range of beautiful concrete finishes. We do any type of finish that a customer wants. There are so many different finishes but the ones below are the basics and from there we can mix different colors and finishes together to form any custom look that may appeal to the individual customer. We have been providing professional and high quality concrete services since 1991. You will find a few of these services listed below. We service Lodi, Stockton, Dublin, Elk Grove, San Ramon, Livermore and neighboring cities in California. Colored concrete is achieved in two ways; the first is that the color is mixed into the concrete at the batch plant. This type of color is known as integral color. The second method to color concrete is the dust on or throw down type. The throw down color is applied once the concrete is poured and is then troweled into the top surface of the concrete. Typically the dust on color gives a more even and accurate color to the concrete but it only penetrates the very top surface of the concrete whereas integral color is distributed throughout the entire mix. There are many different selections to choose from when using color so one can achieve many different type of looks to match any type of environment. Stained concrete is a type of concrete that starts out as just regular colored concrete that is usually a smooth troweled finish or broom finish. After the concrete is finished and cured the stain can be applied for a different and varying color scheme. 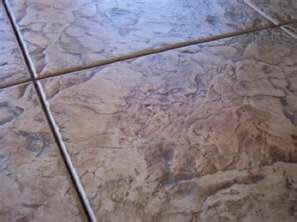 When staining concrete you can apply several colors to the concrete which gives a mottling appearance. 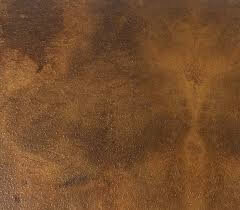 Stain can also be applied to existing concrete giving it a new colorful look. 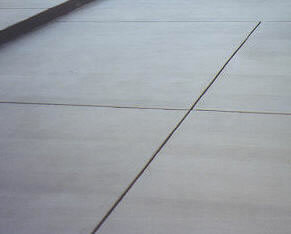 Broom finish concrete is the most common type of concrete finish. After the concrete is poured and troweled, one final step is to pull a special broom across the finished surface leaving a light texture on top of the concrete from the broom. This leaves a light texture on top creating a non slip surface. Broom finish concrete can also be colored using integral color that is mixed with the concrete or you can apply a dust on type color. 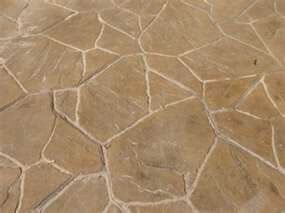 By coloring the concrete, one can achieve special effects and can enhance the project greatly. 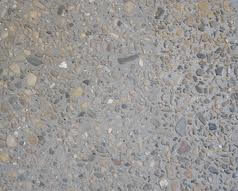 Exposed aggregate is a finish that is achieved by pouring concrete and then removing the top outer layer of the concrete thus exposing the natural aggregate in the concrete mix. The rougher finish is very good for non slip type of applications. This finish also adds a texture to the concrete which creates more design interest. Integral colors can also be added to create a unique look. Seeded aggregate finish is done essentially the same way that the exposed aggregate with the difference that the aggregate which will be exposed is hand seeded onto the top layer of the concrete. 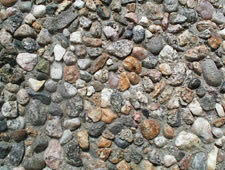 When hand seeding concrete there are many different types of aggregate that can be used to achieve many different types of looks and colors. Salt finish concrete is a type of finish that has small indentations from distributing rock salt onto the surface of the finished troweled concrete. 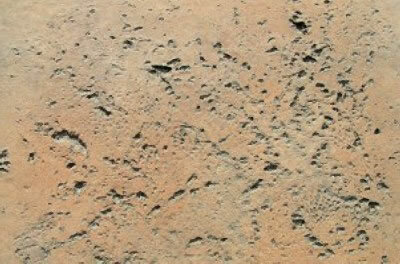 Small impressions are achieved by rolling the distributed rock salt with a weighted roller leaving a textured imprint. You can also add color to any salt finish concrete. 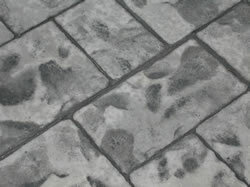 Stamped concrete is commonly referred to as pattern stamped concrete or imprinted concrete. 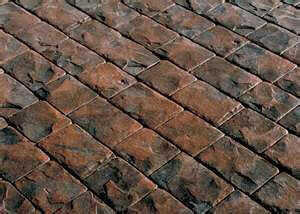 It is derived from using one of many types of stamps which leave an impression in the concrete at the time of finishing. 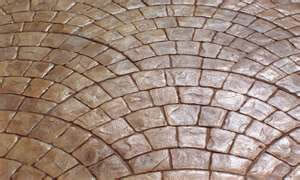 There are many types of patterns available which resemble brick, slate, flagstone, tile, etc. Color is usually added as well allowing it to blend in with surrounding stone and other elements. 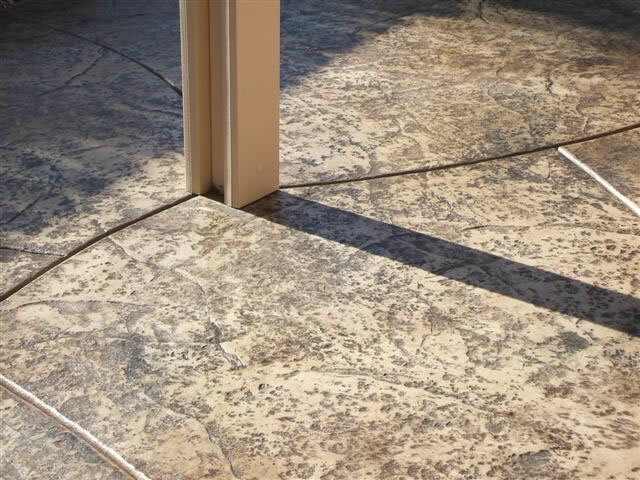 Stamped concrete can also be blended with other finishes such as broom finish, exposed aggregate, or salted finish for an endless choice of design options. 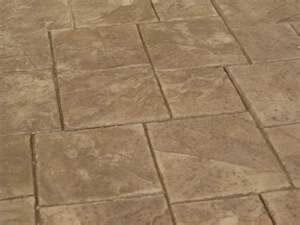 Stamped concrete patterns are concrete patterns that are designed to resemble the look and feel of other natural materials such as brick, slate, flagstone, cobblestone and many more. Because they have the ability to resemble these other building materials, it makes them a less expensive alternative to using those actual materials. With so many patterns to choose from, it should not be a problem to find one that fits your needs. Interested in Poured Concrete Slabs, Countertops, Driveways or Patios?